Flexible with regards to formulas and quantities, pure metals and alloys can be provided in custom shapes and sizes to meet casting, plating, brazing, soldering, and other application requirements. In addition to standard nickel shapes, service deals with powders and shapes for Dipolarized Ni Anodes, Ni Cathodes, Low Melting Foundry Shot, as well as Ni-Copper and Cupro Nickel in standard and special compositions. MonelÂ® (Nickel-Copper alloy) and Nickel-Silver are also available. Belmont Metals Inc. - non ferrous specialists since 1896 - is a manufacturer of standard & custom non ferrous metals and alloys for casting, plating, brazing, soldering, chemicals, and other uses. We have an extensive inventory, flexibility in formula's, shapes, quantities, and lead times. 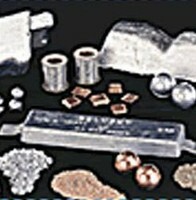 In addition to long standard nickel shapes Belmont now provides powders and shapes including Dipolarized Ni Anodes, Ni Cathodes, Low Melting Foundry Shot, also Ni-Copper and Cupro Nickel in standard and special compositions. Nickel is most commonly alloyed with Copper. Virtually all marine valves are made from Cupro-Nickel to withstand sea water corrosion. Indeed, the famous sinking of the U.S. Navy submarine "Thresher" back in the early 1960s brought attention to the need for weldable Cupro-Nickel fittings that soon became standard in the marine industry. Belmont also supplies Monel®, a Nickel-Copper alloy, and Nickel-Silver, which are FDA-approved for materials used in the hygienic transport and storage of dairy and food products. Nickel-Silver's white color is also ideal for many decorative applications such as the trim on stoves, jewelry, antique car parts, and window hardware. About 10% of today's Nickel is used for electrolytic plating which provides other metals with increased resistance to higher temperatures and corrosion. 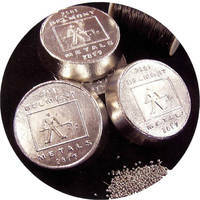 Nickel's ability to bond with many metals explains its popularity in "sandwich" applications. Belmont Metals offers pure metals and alloys in the custom shapes or sizes you require at low prices. With over 1,000 products in inventory coupled with our lustrous reputation for metallurgical innovation, Belmont provides the vital ingredients for your business success. Metallurgical assistance in product selection and application is available. 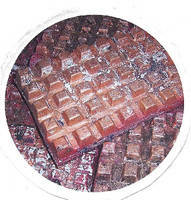 We offer an extensive and diversified inventory, a variety of shapes, in any quantity. With over 100 years of experience we have provided the highest quality products to meet all industries specification requirements with quick delivery and reasonable prices for metals and alloys worldwide. Call the experts at Belmont Metals today at 718-342-4900 or fax your application requirements to 718-342-0175. Visit us at www.belmontmetals.com. We showcase a product bulletin that features articles for all your alloy metals.